The annual Asia Pacific Economic Cooperation Summit (APEC) fell into the welcoming arms of Filipinos this year, and it is no big deal at all. Trust us on this one—when we say it's not a big deal, we just mean a days-long class (and government offices) suspension. Wait, okay, it's kind of a HUGE DEAL. And while you may be thinking of going on a field trip this week, there's a flipside to the "APEC holidays": because of the big event, there is a furor in the metro right now, thanks to the thousands of cancelled flights and road closures that has so far led to traffic chaos in Metro Manila. For our latest FHM Explainer, we shed light on everything APEC and why it might turn out to be more than just a chance to go on a vacation. From who's coming over, to how APEC-tado (don't mock us, that pun is everywhere) we will be, here are the things you should know about this international business meet. 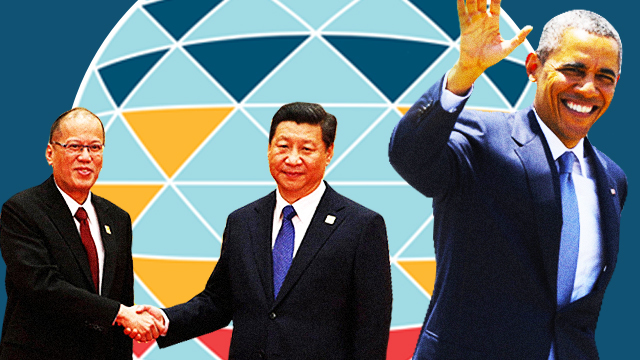 WHAT THE HELL IS APEC AND WHY THE FUSS? The APEC is an annual forum promoting primarily trade liberalization, economic growth, and prosperity among its 21 member countries in the Asia-Pacific region. Founded in 1989, it is believed to be a response to the growing independence of Asia-Pacific economies. We are actually hosting another APEC summit after nearly 20 years (we first played host back in 1996). Various meetings and agendas are slated from November 12 to 19, but the highlight of the whole event is the two-day APEC Economic Leaders' Meeting from November 18 to 19. It will be held at the Philippine International Convention Center in Pasay City. Prominent people have already RSVP'd to President Benigno Aquino III's invitation, including US President Barack Obama, who is also set to have a side trip to our coastal facilities during his two-day visit. Chinese President Xi Jinping also intended to sign the attendance sheet despite the whole South China Sea - West Philippine Sea territorial dispute. Thankfully, China gave the assurance that they won't be discussing the regional feud during the conference. Also included in the VIP list are APEC first-timers Canadian and Australian Prime Ministers Justin Trudeau and Malcolm Turnbull, respectively. Unfortunately, Russian President Vladimir Putin and Indonesian leader Joko Widodo will have to skip this year's summit due to domestic concerns. However, Putin assured we can count on his representative Russian Prime Minister Dmitry Medvedev's presence. Aside from the leaders, there will be around 7,000 delegates consisting of business tycoons and CEOs, and 2,000 foreign and local journalists, who will be stationed at the World Trade Center (which will act as a fully-equipped International Media Center). WHAT IS THE MAIN FOCUS OF THE FESTIVITIES? The overall subject of APEC 2015 is to promote inclusive growth in the Asia-Pacific region, hence under the Philippines' leadership is the birth of the theme "Building inclusive economies, building a better world." The conference will focus on the role of small-and-medium enterprises, which account for 97-percent of businesses in APEC economies. SOUNDS A LOT OF WORK! SO, HOW MUCH CASH DID WE SET ASIDE FOR THIS? It is a lot of work. Not to mention three years of meticulous planning and a lot of cash, too, (to the tune of P9.8 billion), for venues, hotel accommodations, transportation, food, meetings, uniforms, cultural presentations, and a higher level of security. Although the budget allotted is quite overwhelming, Marciano Paynor Jr., head of the APEC National Organizing Council, defended it and even said that China's hosting last year was more expensive. In his recent interview with Rappler, he assured that "the money goes back to our economy. It plumps the economy." The government is asking for our full cooperation and understanding because it is apparently deploying all the resources it can to ensure a successful hosting. PNoy also promised to showcase our legendary hospitality as the "Perfect Host,"
HOW 'APEC-TADO' ARE WE BY THIS VERY HIGH-PROFILE EVENT? While some are convinced that the suspension of classes and time off from work may have a bad effect on our economy, many are still rejoicing because, well, #vacay! Meanwhile, the Philippine Star compiled a comprehensive list of cancelled flights for those planning to leave the country within the next few days. Awareness is equivalent to fewer tantrums, you know. ...WHAT DO WE REALLY GET OUT OF THIS? For starters, the government indicates inclusive growth and a better economy as the long-term goals. However, the main outcome still remains to be seen. Perhaps for now, what we can all hope for is that "what happens in APEC, doesn't just stay in APEC."